I believe that everyone who loves fashion has an icon whose style they admire and use them as an inspiration. Some icons may come and go but there are few who will always be on our radar for timeless chic and unforgetable fashion moments. One of such people is Grace Kelly. Famous since her acting days and as a Princess Grace of Monaco, that woman knew how to dress! 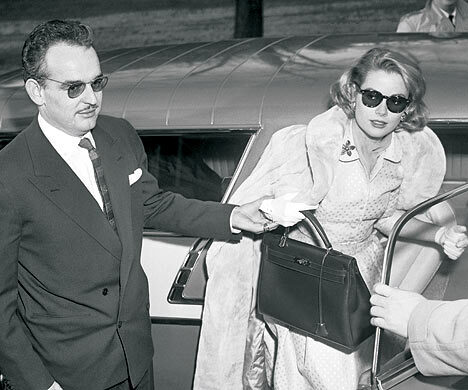 So much so that a Hermes bag she loved to carry has been name after her – The Kelly bag. Who wouldn’t love to own one? Victoria Beckham is rumoured to have a collection of them worth £ 2 million, including some limited and very rare editions. If you can’t afford one, at least you can have a look at the original piece as it is going to be shown at the V&A. My favourite museum is holding an exhibition called GRACE KELLY STYLE: FASHION FOR A HOLLYWOOD PRINCESS from 17 April to 26 September 2010. I know it’s still a long time to go but I bet it will be worth the wait. There will be other things on display, including the gown she wore to accept her Oscar award in 1955, her wedding dress and couture gowns from popular couturiers. I can’t wait to see it all and will remind you nearer the time as this is an exhibition not to be missed!! !